OK, so this hall is technically in neither Warwickshire nor the West Midlands, being somewhere between Bromsgrove and Kidderminster. But it’s an absolutely fabulous little church hall. It’s a quirky and gorgeous Grade II listed building. The kitchen was good enough for my party host to be able to put on a three course dinner, and the hall required no decoration at all. There’s ample parking and the loos were good. I should imagine accessibility would be a problem – there were steps all over the place! But for a family celebration, this is a top-notch venue. I have been to loads of parties and events at this venue – it is very popular indeed. And it’s easy to see why. There are two good sized halls available for hire. The kitchen is small but effective. The loos are very nice. There is ample parking and accessibility is very good. If you have parents who don’t want to sit in the party but would rather not go too far away, there’s a small seating area between the two main halls. If I were there as a children’s entertainer, the space would take some getting used to because it is so big and noisy, particularly the larger of the two halls, but I have loved painting faces there! All that light and space!! It’s an awesome party venue! This is a really lovely hall – very attractive and easy to decorate. Again, it’s kind of starkly furnished, so it makes for a noisy party, but the wooden floors make it easy to clean. I found it tricky to find, but navigation was never my strong suit so I wouldn’t discount it on those grounds. Parking was good. The loos were nice. The kitchen is fine. Accessibility is good. Yet another hall that defeated my SatNav! Once I’d found it, it was an absolute delight to work in! Bright, airy, lots of outside space. Very attractive indeed, both inside and out. The facilities were great, apart from parking, which was only OK. Accessibility was OK.
Another very roomy and versatile venue, this church has a number of other meeting rooms available as well as a bright and airy church hall. The website is also very easy to navigate! The kitchen is adequate for most events, and there are a tables and chairs available. Its size, and the wooden floors, might make it a bit noisy for an entertainer but I have shared the space with a bouncy castle and a lot of children, and the hall never felt crowded. There is a good amount of parking, and accessibility is good. This hall is right on the edge of a park, which can be a good or bad thing, depending on your party. It’s a good size hall, with a small stage. The facilities are basic but perfectly adequate. There’s ample parking and accessibility was good. This is a nice sized hall. By that, I mean that it’s a nice size for the children’s entertainer/face painter combo. It’s bright and clean. It isn’t, in my opinion, quite big enough for a bouncy castle to fit comfortably. The kitchen is fine, as are the loos. There is lots of parking and accessibility is OK. The website is great! The first thing you will notice about this hall is the ample parking! I cannot tell you what a boon that is… The hall looks a bit ‘meh’ from the outside, but it’s actually a great party space, probably not quite big enough for a bouncy castle, but a great size for a whole class party with an entertainer. The kitchen is small but perfectly formed. The loos are fine. It’s right next to a park, so the outside space is great. Accessibility is good. What is it with these heavenly village halls that are hell on earth to find? The postcode for this hall has a fairly wide reach; this is unfortunate because every second house in Leek Wootton is the size of your average village hall. Anyway, it’s up a hill, on the right as you come to it from Kenilworth. Happy hunting! When you do find it, it is lovely. The hall is an unusual shape (not hard-to-decorate unusual – it’s just designed to show off the high ceilings) and very bright and airy. The kitchen seemed fine. I do recall there were problems with getting the electricity out of the kitchen and into the hall, though that might have been a one-off problem. There’s ample outside space and good parking. Accessibility might be a bit of an issue. I found this hall exceptionally difficult to find. Maybe it was a postcode issue, or just my own natural lack of direction, but I recall that by the time I found it I was not in the mood for noticing the finer details of the venue! To be fair, it was actually a nice hall – a good size and very bright. The kitchen was fine, as were the loos. There was lots of parking. Next time, I shall have a closer look! This hall is carpeted. The carpet is the hard-wearing utilitarian kind, and it has withstood many a messy play session, but it’s something to bear in mind. The hall is on the smaller side, but I should think it would still be big enough for a bouncy castle. It has patio doors leading onto… a patio! There are then a number of steps leading down into a very big garden that is not securely enclosed. You might want to bear this in mind if you are having a party for early-years children. Or bolters. But this would only be an issue if you wanted to open the patio doors – the hall is otherwise very secure. The kitchen is fabulous (with the usual serving hatch) and the loos are great. It’s a bright, attractive hall, with lots of tables and chairs that are hidden away in a cupboard, so unused ones won’t ruin your decor plans! Knowle has an abundance of great halls, and this is yet another. Lovely big space, lovely big kitchen too. There’s no stage, but I very rarely see them used at children’s parties anyway. There’s a big car park behind the hall, which is generally fairly full during the week, but is less busy at the weekend. Parking is free for up to 3 hours – just don’t forget to get a ticket from the machine. Accessibility is good, the loos are fine. Most of my jobs are within the Balsall/Solihull/Coventry area, but for some reason I have done a lot of gigs at this venue in Whitnash near Warwick. And a very nice church hall it is too. There are patio doors that open at the back onto the garden, the kitchen is great, and there’s lots of space that somehow manages to still feel comfortable and intimate. The loos are fine, and there’s a nice milling-around space outside the main hall. A fab venue for family parties. 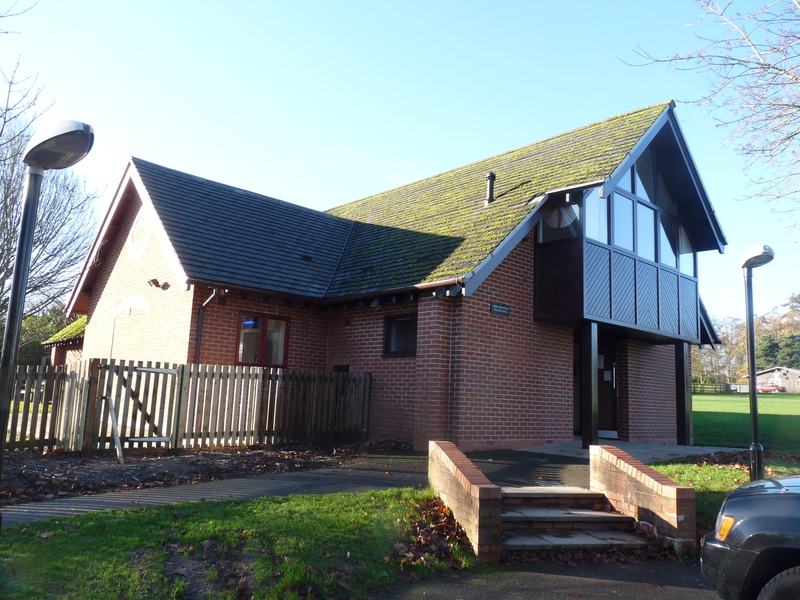 This is a very popular church hall in Knowle. In fact, it’s so popular, its availability as a casual booking venue is very limited. The website is helpful and transparent so you can check your chances of being able to book before you fall too much in love with it. It’s an attractive, wooden floored hall with all the usual amenities. There’s a nice outside space, and parking is adequate. Accessiblity is good. So there you have it! I know there are other halls that I haven’t discussed so if you know of another great hall, please do leave a comment! And if you don’t agree with my verdict on your favourite venue, just leave a comment.